Have you ever had what you thought was a really good idea but when you actually tried it you realized that it was profoundly stupid? That happened to me the other day. Most every Thursday I play basketball at the MSU Wellness Center with a friend of mine. We play 21 with no takebacks which means we get a lot of wide open layups. One day I was red-hot, draining one three after another. Rob Cross, the women's basketball coach, happened to see the end of our game and he suggested I play with his girls sometime. I thought that sounded really cool so I took him up on it. I had no idea what I was getting myself into. 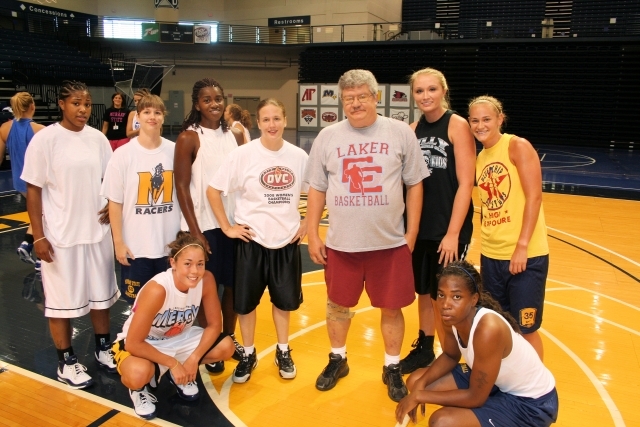 Last week the Racer Insider webmaster Shawn Dunnaway and I showed up at the RSEC and took the court with the MSU women. We started with a two-on-two game against Amber and Paige Guffey. We played to five with each basket counting as one point. It was quickly apparent that we couldn't guard either one of them as they jumped out to a 2-0 lead. I finally answered with a wide open three at the top of the key. Amber seemed to take offense at that and started guarding me TIGHTLY. After that it was difficult to get a shot off as she mirrored the ball with her hand. Following a wide open jumper by Paige and a layup by Amber it was 4-1 and we were looking at a blowout. On the next possession she hit a three and it was over: Amber and Paige – 5, Will and Shawn – 2. You'd think I would have had the sense to quit. But no. That would be the easy way out. Instead Shawn and I played a five-on-five full court game with them. And as long as he was in the game I did fine because we guarded each other. Neither of us scored. But about midway through the game Shawn asked for a sub. Suddenly I was stuck guarding freshman Jana Roney. Can you say mismatch? She was constantly in motion and far too quick for me. In fact the most startling thing about the whole experience was the pace of the game. And when you play full court with guys and there is a runout only three or four people actually run. Everyone else lags behind and rests. When I played with the MSU women everyone ran and if I didn't run that meant whoever I was guarding got an open shot. There was constant motion. In the pickup games I've played in there isn't a lot of movement because a couple of players on each team usually get all the shots. Everyone else stands around and watches. These women were always moving, running and cutting and setting screens. At times everything was a blur. When it was over I walked off the court exhausted as Amber called out, “Good job Will!” Let me assure you, she was being gracious. She is by the way clearly the leader of this team. She organized the games and set the two teams. And every time we had the ball she brought it down the floor. All in all, even though it was humbling it was a lot of fun, kind of like that fantasy camp that Michael Jordan hosts except that I didn't have to pay $25,000 to play. You see, at heart I'm a fan. I sit in the stands for the women's games and scream like a maniac. To me, they're stars. So it was a special treat to get to play with them and I'll remember it fondly for a long time. Now they can return to the real business of preparing to make it back to the NCAA tournament. And I can get back to being their biggest fan.